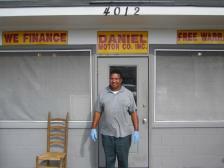 I'm Jimmy Daniel, the proud owner of Daniel Motor Co. Inc. I've been married to Debbie Daniel ( who also works here )for 31 years. I have been blessed with 2 wonderful children. I am active in my church Aldersgate UMC and also in my work community at 4012 Mobile Highway. My interest are family, hunting, fishing and CARS. I have collected classic muscles cars for years and still enjoy NHRA drag racing. I still have several GTOs as well as two race cars. Cars have always been my passion. That is probably why I enjoy the car business as much as I do. That and the relationships I have built with my customers and their families thru my 36 years at Daniel Motor Company. Allen joined our staff in September of 2012. He manages the day to day operations and can help out if you have an issue that the rest of the staff could not get handled. Allen graduated from ACA in 2005 and went on to graduate from Auburn University in 2009 with a degree in Horticulture. He married his wife Casey in 2010. 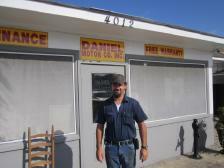 Tony has been working full time at Daniel Motor Company since 2005. He has served as mechanic, office staff, salesman and in 2012 he was promoted to Purchasing Agent. He handles all purchasing and vehicle inspections. As well as sales and customer service. Tony does it all so give him a call. Mark is our shop manager. Mark has been with us since 2014. He has worked in every department we have and now runs our brand new service center. Mark does his best to make sure your car is running right. Shay joined our staff in June 2017 and can handle any of your sales or customer service needs. She has a great attitude and is ready to make a deal!! Shamica joined our staff in January 2018 and has been a great addition to our sales team. Sherika joined our staff in September 2014. She is our longest tenured collector and has a great relationship with her customers. If you have an issue with your account, give her a call so she can help. Shaniece has been with us since April 2016. She is one of our collection specialist and can help you with any of your payment or customer service needs. If you have an issue with your account, please give her a call before it is too late. The best detail man in Alabama! Willie cleans em and sales em as good as anyone around. No car is too dirty and no sale is impossible with Willie. Janice joined our staff in September 2014. She handles all of our insurance and recall issues. If you have insurance questions, give her a call. Steven joined our staff in June of 2016. He can handle any of your auto repair needs. He is our lead tech and can give your vehicle the final approval before it leaves the lot. Ray joined our staff in November 2016 and can take care of any of your mechanical needs. From small jobs to major jobs Ray can handle it all. Gabe has been with us since 2017, he just got promoted to service manager. If you have any issues with your vehicle, give mark a call or email him and he can make sure your vehicle is taken care of.